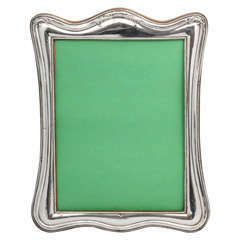 Art Nouveau, sterling silver picture frame, Birmingham, England, 1906, Boots Pure Drug Company - maker. Retailed at Boots. Backed in dark blue velvet. 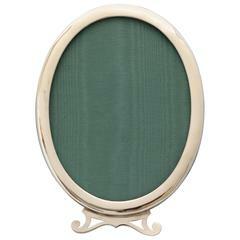 Measures 7 1/4 inches high (at highest point) x 5 3/4 inches wide (at widest point) x 3 1/2 inches deep when easel is in open position; holds a photo 5 3/4 inches x 4 inches and shows a photo 5 1/4 inches x 3 3/4 inches. Dark spots in photos are reflections. Has a few very, very minor dints commensurate with age and use. Otherwise in excellent condition.